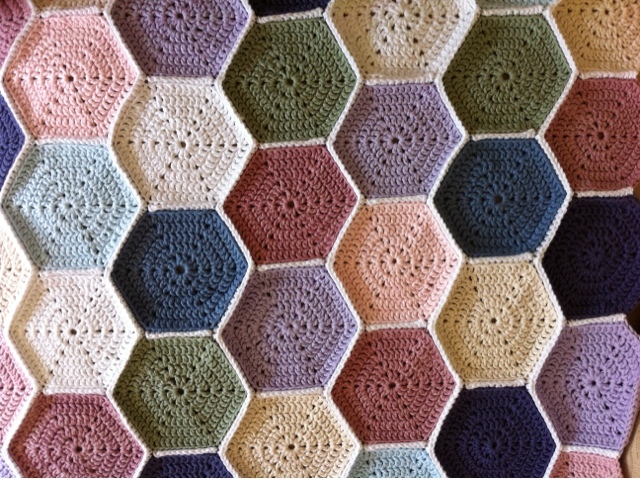 I've finally managed to get all my hexagons joined together into one pretty big blanket :-) Since I've been making these things for actual years, so it is great to actually see it as a usable single thing! I sewed them into long rows of twelve first using a double crochet seam, then joined the strips together to make a big 12 by 12 square. My only problem is that I still have quite a lot more wool left as I originally planned it to be big enough for a double bed.... 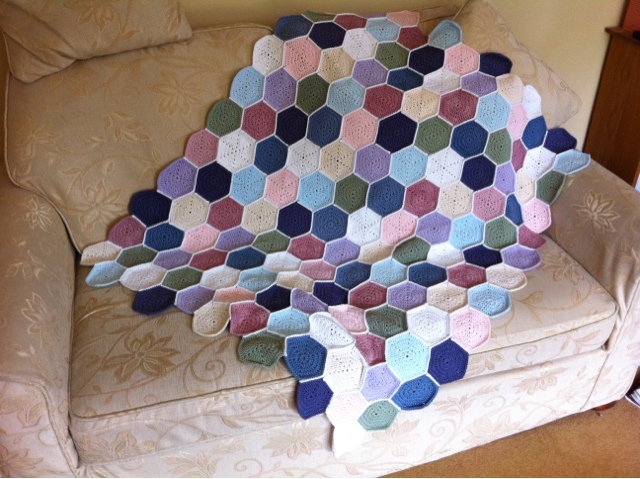 It would be easy to add more hexagons I'm just not sure I can face having to make more! So I think I'll do some different shapes and projects first and then maybe return to this when i have dehexagoned my brain! The white wool long seams running vertically. Sticking the cord in place. 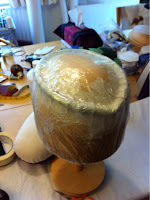 In some ways I think it is a great advantage that I was trained in costume making and not traditional millinery. Whilst I would love to do lots of proper millinery courses and there are lots out there, my health just gets in the way-grr! If I book a course a couple of months in advance I can guarantee that I will end up on ivs or in hospital and miss it- I've missed so many exhibitions, concerts etc. in this way that I do everything at the last minute these days so I don't waste my money... One of the best things I learnt at RADA is that is doesn't really matter how you get to the end costume, as long as it looks correct and can stand up to the abuse most actors put their costumes through! 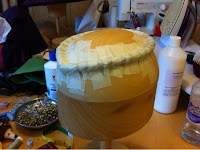 As such, whilst I have read loads about millinery techniques and have bought pretty much every book I can find on the subject, I don't always follow the rules, they are more, well, guidelines! 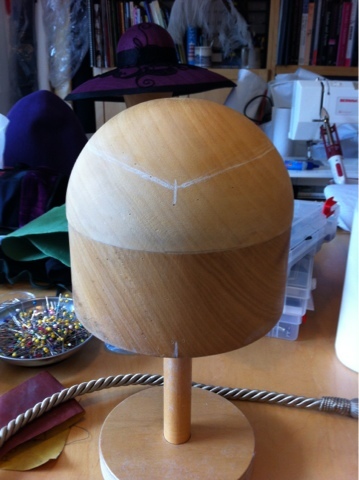 As such, when I wanted to create a hat with a ridge around the top of a domed crown, I didn't commission a new block-much as I would love to be able to afford to do that, I decided to have a go at making adjusting my dome block to create something that would work. I decided to try adding a ridge of upholstery cord with a point at the front which I could create a pork pie like valley round the top. I chalked a line I liked onto to block (it does not permanently mark my lovely block) and the used masking tape to hold the cord in place. 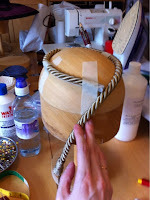 The masking tape is strong enough to block over but can be peeled off easily to get the position of the cord just right, and to take it off when I've finished without damaging the block. 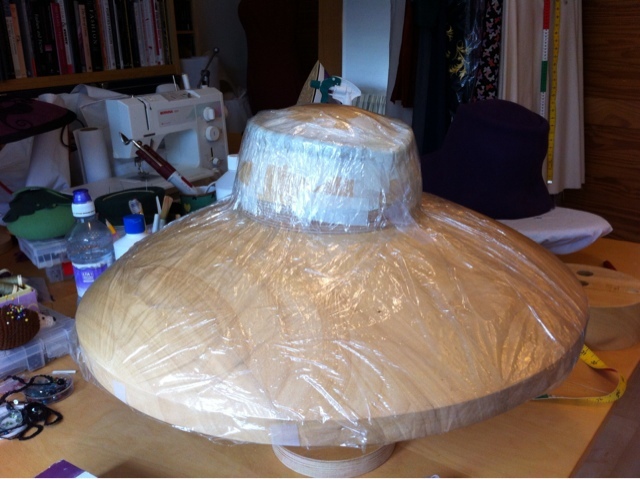 Covered with cling film and ready to block. I blocked the felt in the usual way, by steaming it a lot over the kettle and pulling it over the block. As with the mini pork pie hat I made in my last post I used blocking reed to keep the felt in the valley round the top- I love blocking reed! Once it was dry I used my iron and a damp tea towel to start stretching the felt below the elastic holding the felt in place; I needed to start forming the brim off the brim block so I could attach the crown part to my huge brim block and block the hat in one piece rather than cutting off the excess felt making that into a brim and then sewing the two parts together again. 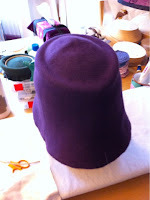 It took quite a bit of stretching and steaming to get the brim nice and smooth, but I got there in the end! and covered in loads of clingfilm! The felt on the joined blocks. I am so pleased with how this hat turned out! 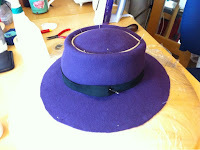 The improvised block shape worked marvelously and produced a lovely smooth ridge with a slight fedora like feel, and the brim can by changed to either by down turned all round, to a sight upturn at the back. 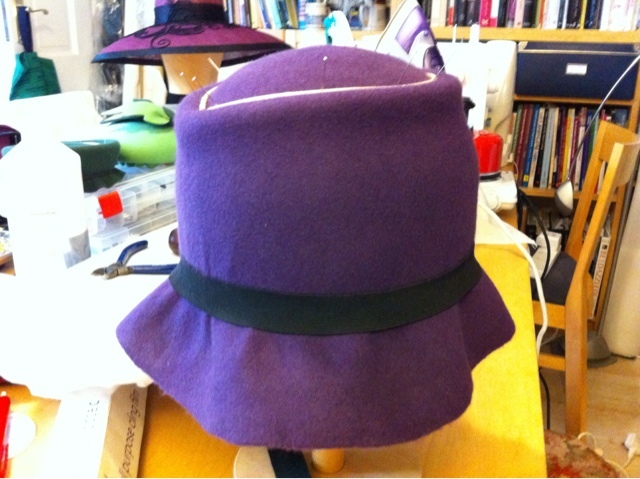 I finished the hat very simply with a black petersham hat band, with a simple loop covering the join, it is such a lovely shape I did npt want to cover it up at all. 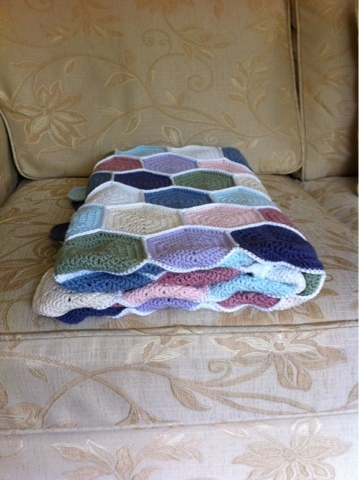 I shall definitely be wearing this come winter time, and I will also be trying more cord additions to my blocks. 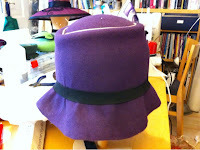 The finished hat at a rather rakish angle!